This article concludes our three-part series on packing carry on only. We recommend starting with the first two articles in the series to learn the rules for carry on luggage and the principles for packing carry-on-only. As I stood next to the luggage carousel waiting for my bag, I realized the absurdity of the situation. I was in Frankfurt, the first stop of a two-week backpacking trip through Europe. Traveling light. Traveling fast. Staying flexible. We hadn’t booked any train tickets or hostels past Germany’s financial capital. Why was I waiting (with fingers crossed) for my backpack? I shouldn’t be at the mercy of the airline. I should control my own destiny. This was my “see the light” moment. Checking luggage made no sense. Now, years later, baggage fees have become common, and checking luggage makes even less sense. If you’re reading this article, you’ve seen the light too. Whether you’ve always packed light or are a recent convert to the carry on club, you’re in the right place. The most important decision you’ll make is the bag you carry. 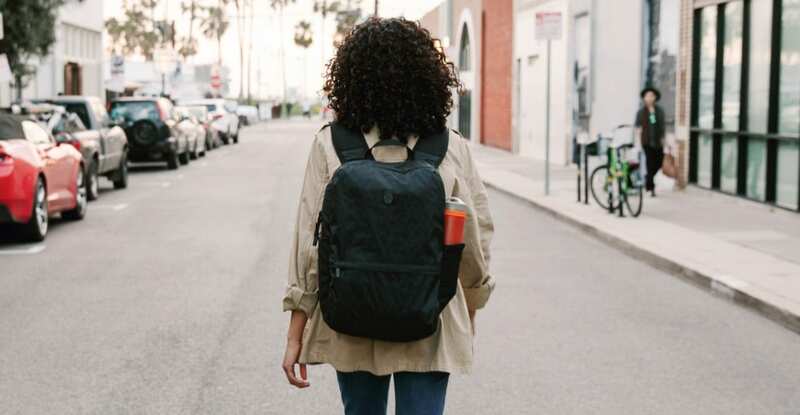 Tortuga backpacks are the best backpacks for urban travel. 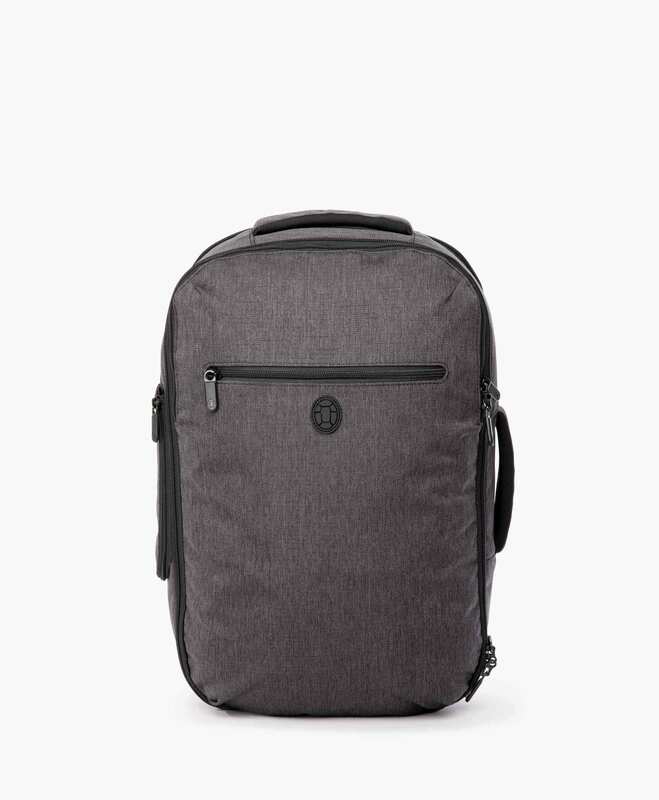 Outbreaker travel backpack was named Wirecutter’s Best Carry On Bag and Setout travel backpack won Carryology’s Best Carry On Bag as well. The 45 liter Outbreaker and Setout backpacks maximize the allowable carry on space of most major airlines. 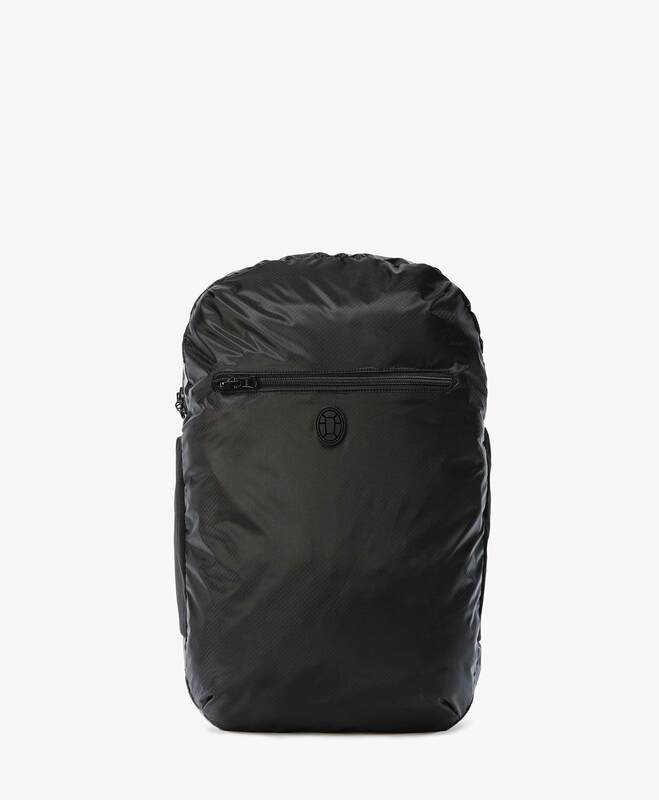 The 35 liter Outbreaker, or the flexible 26-34 liter Setout Divide are better choices for smaller framed people or those who travel ultra-light. The packing cubes, made to fit either Outbreaker or Setout perfectly, will keep your bag organized, the 45 L Outbreaker and Setout hold two full sets! 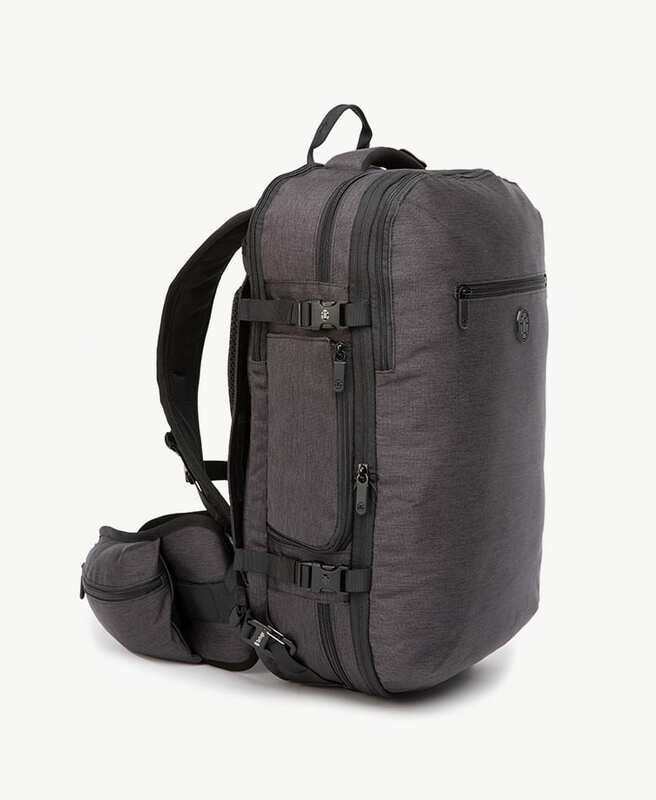 Throw in a packable duffle as overflow space, and a daypack for carrying your computer and daily necessities once you hit the ground. In the first two articles in this series, we discussed the rules for carry on packing and the principles to help you maximize your packing space. 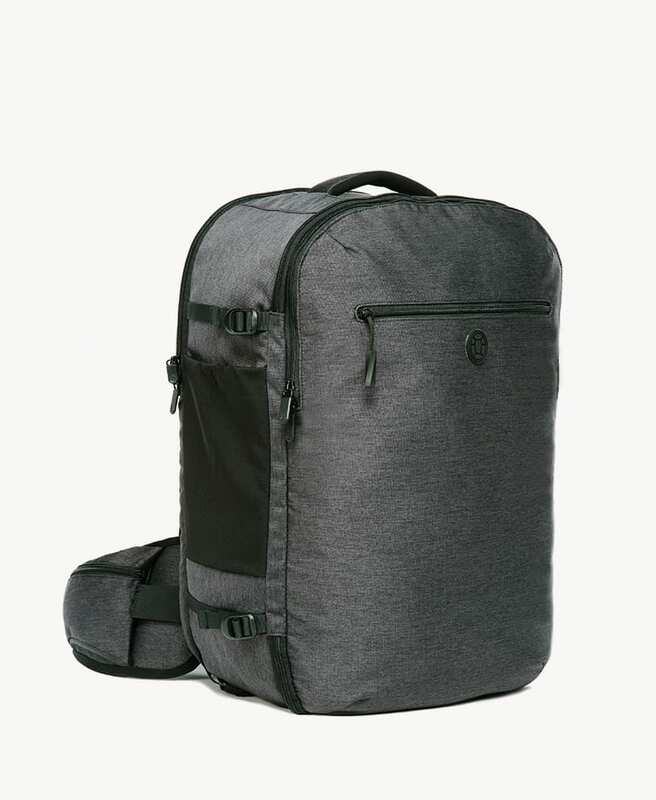 In this article, you will find a complete carry on packing list with links to some of our favorite products to get you started. This post is long. You may want to bookmark it for reference later. If you want to skip the post and get your packing list now, enter your email below. Get a printable carry on packing list to use on your next trip by entering your email. You’ll also receive our weekly packing tips. No matter what type of trip you’re taking, you can find a specialized packing list online. From a rainy weather packing list to a minimalist packing list, to a packing list for what to wear in Europe without looking like a tourist (no joke). The purpose of this list is to provide an all-purpose, carry on packing list that anyone can use. By understanding the principles from the last post, you can customize the list to fit your needs. Add your own personal flair so that you feel comfortable and confident when you travel. If you feel like you’re wearing a costume, you won’t relax and enjoy your trip. We’ve broken the list into categories: clothing,paperwork, toiletries, electronics, and gear. After these sections, you’ll find some help on how to pack difficult things, and a downloadable, printable packing list to use on your next trip. The primary purpose of the list is not to specify what you will take with you on any particular journey, but to serve as a model for your travels, a constraint on your packing exuberance, a personal blueprint that you can refine over time (not change every time). With this purpose in mind, we present a rough outline of the clothing that we recommend. This list is a suggestion, a framework. Your wardrobe will vary by your style, trip length, and the weather at your destination. Packing is like grammar. You have to know the rules before you can break them. The secret to packing easily in only a carry on bag is to develop a capsule wardrobe of mix and match pieces that will combine into a variety of outfits. Choose the core pieces of your wardrobe in solid, coordinating colors, like black, grey, or navy. Then add accent pieces and accessories to add flare and flexibility. The packing list below includes our suggestions but is adaptable to your style. Are you a jeans and t-shirt person? Skew your list toward those items and cut other stuff. Prefer dresses and leggings to shirts and pants? Bend the list to match your preferences. This packing list is designed to give you a starting point and to show you just how much you can fit in a carry on bag. Please substitute items to maximize your comfort and happiness. The goal is to make packing easier. Once you’re packed, you shouldn’t have to think about your clothes. If you’re on a winter trip, it’s easy. Wear, don’t pack, a warm coat. Fleece or down work well. Compare some of the best winter jackets and choose one that’s packable and lightweight. I’ve worn a Patagonia R2 as my winter coat for years. Wool base layers, a down jacket, and a fleece jacket will provide enough warmth for almost any weather. For rainy weather, get a packable rain jacket. It will keep you dry when in use and pack away into your bag when the weather dries up. Make sure that you can either wear your coat at all times (heavy winter coats) or pack it away. Even a lightweight hoodie can eat up space in your bag. Feel free to shift these numbers around depending on the weather. Packing six shirts and wearing one will give you a week’s worth of different shirts without repeating (or washing) any of them. Not that anyone would notice. American Apparel t-shirts are a good balance of price and quality. However, their shirts are mostly cotton or a cotton-polyester blend. Icebreaker wool t-shirts are more expensive but a worthwhile investment. UnderArmour and Nike both make high-quality, moisture-wicking athletic shirts. Make sure to rinse them at night if you’ve been sweating. Synthetic fabrics can stink. For long-sleeved shirts, pack one wool base layer shirt and one nicer shirt for going out. If you’re considering a hoodie, here are some good ones that are travel friendly. Flannel shirts are fantastic for travel too. Some people like non-iron, stain resistant shirts, but I think the fabric feels too unnatural. Substitute shorts or pants depending on the weather on your trip. Including the pants that you’re wearing, you will have three total pairs. Those will get you through the week without repeating any one pair too much. Pants can be bulky, so pack conservatively. I live in jeans and recommend them for travel. Always wear your jeans when in transit because they will use up too much space in your bag. A lightweight pair of gym shorts are good for lounging, sleeping, or swimming (for guys at least). Include a swimsuit if you plan to be in the water. With the right fabrics, you can be as stingy as you want with underwear. We’ll take a more practical approach. Combined with what you’re wearing, this will get you through an entire week without doing laundry. If you’re willing to hand wash your undergarments, you can pack as few pairs as you want. We recommend ExOfficio underwear for men and women because they eliminate sweat and odors and are quick-drying. For socks, we love Smartwool. They really are significantly better than other socks. They stay up, feel snug, and let your feet breathe. The latter is crucial when you’re on your feet all day. If you’re bringing more than one pair of shoes, pack the lighter pair. Your boots or sneakers might not be as convenient for air travel, but they’ll use up too much space in your bag. Wear them even if they don’t make sense with your flight outfit or destination weather. Sandals, flip flops, ballet flats (for women), boat shoes, or espadrilles all pack well. Think small, flat, and light. Avoid anything with thick soles or heavy padding. Pack the necessities you need and functional items, like scarves, that you can use in multiple ways. Don’t leave home without it. Passport requirements vary by country. To be safe, make sure that your passport is valid for six months beyond the end of your trip. The State Department recommends renewing your passport nine months before it expires. Apply for or renew your passport through the State Department’s website. I put my passport on top of my backpack so that I can’t forget it. More than once, I’ve been halfway out the door before remembering my passport. A form of identification from your home country, for example a driver’s license, can serve as extra proof of your identity. After your passport, your boarding pass is your most important document. Mobile boarding passes are convenient, but make sure that you’ll have internet access via your phone if you plan to use one. Or, take a screenshot of it. Some countries won’t let you in without a guarantee of when you’ll leave. Pack a copy of your complete itinerary, including evidence of when you’ll leave the country, to appease border security. For your own convenience, print out the details of your transportation from the airport to your accommodations (if you’ve booked anything), the address of where you’re staying (for customs forms and taxi drivers), and confirmation of your visa on arrival (if applicable). I like to save all of these details in TripIt for my own reference and convenience. However, paper copies are better for border crossings and for when you don’t have WiFi access or a local SIM card. Make copies of your passport, ID, credit cards, and debit cards. If your passport is stolen, you’ll have an easier time getting another one if you have a copy of the information page from your original. If your wallet is stolen, you can reference the copies of your cards to find the phone numbers to call to cancel your cards. You should also send a paper or virtual copy of these documents to a trusted friend or family member in case of emergency. Pack a few extras as some countries, like Vietnam, require passport photos on entry. You can get extra photos taken at drug stores, photography studios, or consulate offices. You shouldn’t have to pay more than $1-2/photo. The cheapest price I’ve seen in San Francisco was at the Chinese consulate. Carry a debit card that won’t charge you a fee every time you need cash abroad. Either use a bank in the Global ATM Alliance or get an account, like the Schwab Bank High Yield Investor Checking Account, that will refund your ATM fees. Make sure that your credit card isn’t charging you an extra 3% “foreign transaction fee” and is earning you points or miles. Read more about our favorite travel credit cards. Pare your toiletries down to the essentials to fit everything in your one quart bag. For carry ons, your liquids and gels must be in 3.4 ounce (or less) bottles. Those bottles must fit into a one quart plastic bag. Each passenger may only carry one such bag. If space is at a premium, don’t pack toiletries. Basic toiletries can be bought at your destination, often for less than you would pay at home. Another option is to swap out wet items for dry varieties. Switching to bar shampoo and conditioner and mineral makeup can free up a ton of space in your quart sized ziploc bag. If you buy your toiletries instead of packing them, you don’t have to worry about the three ounce bottle rule. You can buy any size you want. Sample sizes of soap, shampoo, and face wash won’t last through longer trips anyway. If you don’t pack any liquids, you won’t have to take your toiletry bag out at security either. For a less extreme but still minimal approach, pack the bare necessities: a toothbrush, toothpaste, and face wash. These toiletries are just to feel human while flying. Buy the rest of your supplies when you land. For anything that you must pack, you can find travel-sized products at Target, Walmart, or on Amazon. If you can’t find your favorite brand, want to save money, or want to be more eco-friendly, buy normal-sized toiletries and pour what you need into GoToobs. I use a three ounce GoToob when I need to pack body wash for short trips. To save space, use Dr. Bronner’s Magic Soap. The liquid version is concentrated and can replace your soap, shampoo, shaving cream, toothpaste, and detergent. One liquid to rule them all. Let’s talk about electronics and packing for a minute. First question: do you really need them? If you’re working as you travel, the obvious answer is, “Yes.” If so, think carefully about exactly what you need to take. Second question: Can you downsize? 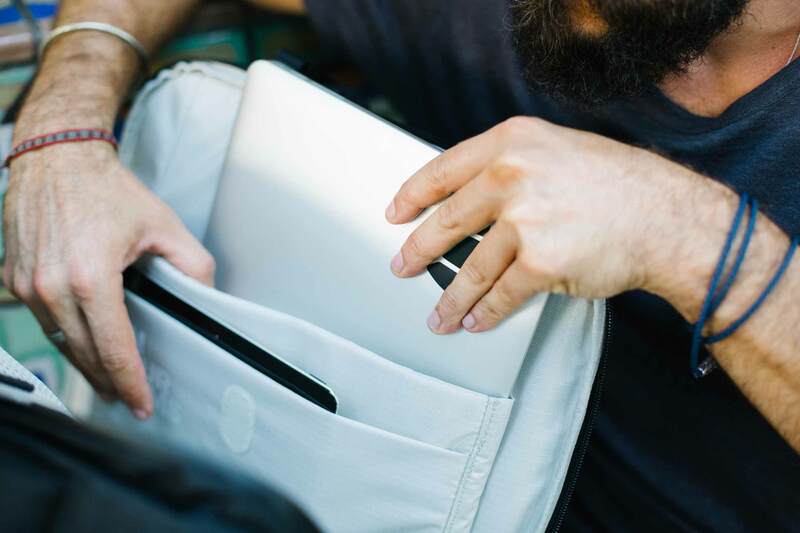 Do you really need that full sized laptop, or can you make do with a tablet for the length of your trip? Could you make do with just the apps on your phone? Pare down and carry as little as possible where electronics are concerned. They’re bound to be the heaviest things in your bag. Carrying an unlocked smartphone will enable you to swap in cheap, local SIM cards in most countries. Buy the SIM card at your destination for low cost voice, SMS, and data plans. The local approach is simpler and cheaper than using US wireless carriers’ roaming plans or relying on WiFi. Of course if you have T-mobile’s Simple Global plan, your phone will just work in 140 countries. That’s winning. My #1 most forgotten item. Even the pros make mistakes. For listening to music or podcasts on long flights and for calling home. I use the Apple earbuds that came with my iPhone. If you don’t already have a pair, consider this list of the best bluetooth headphones, depending on your preferences and budget. Pick an adapter with dongles to fit plugs in any region of the world. Really, that’s all you need. Many travelers do with even less. If you’re a digital nomad or plan to work from the road, then you’ll also need your computer setup. Pack a power strip so that you can charge all of your electronics through one outlet, instead of packing multiple adapters. You could charge your electronics via your computer’s USB ports, but this method is slow and limited by the number of ports on your computer. Apple’s Macbook Pro and Macbook Air are the obvious choices. The smaller and lighter, the better. I’m still lugging around a 15″ Macbook Pro (coming up on 5 years!) but will switch to the Air for my next purchase. If you’re doing some remote work, choose a laptop for work and travel that best suits your needs. My least favorite item to pack because it’s bulky and awkwardly shaped. It’s another reason to get a new computer. For reading or simpler tasks that don’t require a laptop. If you’re already carrying a phone and laptop, the tablet is a luxury. Don’t forget the charger! More cords! Ideal for readers who will have lots of dead time (flights, train rides, bus rides). I love to read but haven’t made the leap to Kindle. I can’t let go of paper books yet. For now, I just pass along my book when I’m done with it and pick up another one at an airport or hostel. This is the catchall portion of the list before we get into how to pack things. Gear includes the miscelaneous things you might invest in to make travel more comfortable, lighter, or safer. A small, TSA-approved padlock is a great theft-deterrent, especially if you will be traveling on trains or buses or staying in hostels. Make sure your suitcase or backpack has lockable zippers. 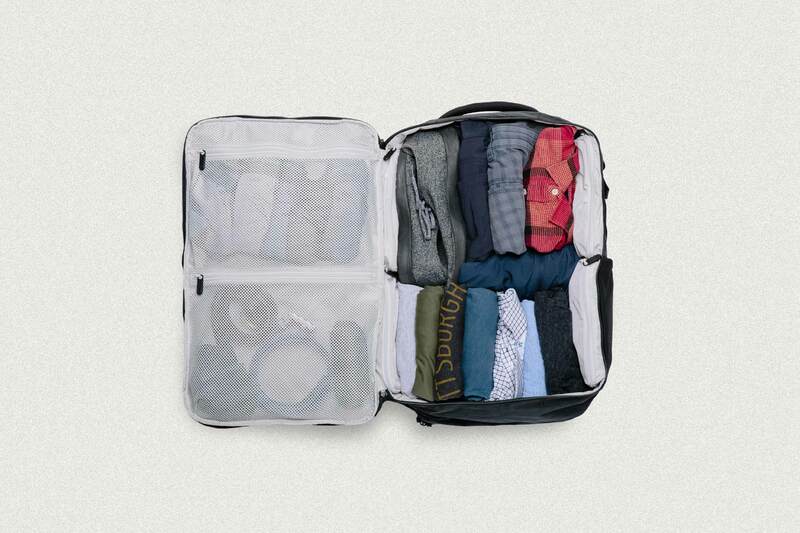 If you need more organization than your luggage offers, use packing cubes. Outbreaker and Setout both have packing cubes that are specifically designed to fit the bag perfectly, maximizing both space and organization. A lightweight, packable travel towel is handy even if your accommodations will provide towels. I use the REI Multitowel Lite, but any similar product will work well. Carrying your own water bottle can help you stay hydrated without going through too many disposable plastic bottles. I carry a Camelbak, and Jeremy loves his Vapur Anti-Bottle. The Wirecutter recommends the Klean Kanteen. If you’ll be taking long flights or overnight trains or staying in hostels, earplugs and an eye mask make for all-natural, compact help when it’s time to sleep on a plane. For filling out customs forms. For documenting your trip, taking notes, or getting addresses written in the local language. If, like me, you haven’t made the leap to a Kindle yet, pack a book to read on those long flights and train rides. Your gear depends on your travel style and where you’ll be staying. Feel free to customize this list to your needs. Here’s the complete list of what you should pack in your carry on in a handy graphic. If you’ve made it this far, give yourself a pat on the back. Your are committed to the carry-on-only lifestyle, and we commend you. The next step is putting it all together, choosing the right bag and then actually packing your stuff. Let’s start with choosing the right bag. You will need the right luggage to pack carry-on-only. Choose luggage that matches your travel style and fits within your airline’s carry on luggage rules. The maximum-sized carry on for city travelers. For some travelers, a two-bag solution is the ideal way to pack. Pack your in-flight essentials, laptop, chargers, and a change of clothes in the Laptop Backpack. Pack everything else you need for your trip in the Duffle Bag. When used together, they’re a luggage system ideal for trips less than a week. 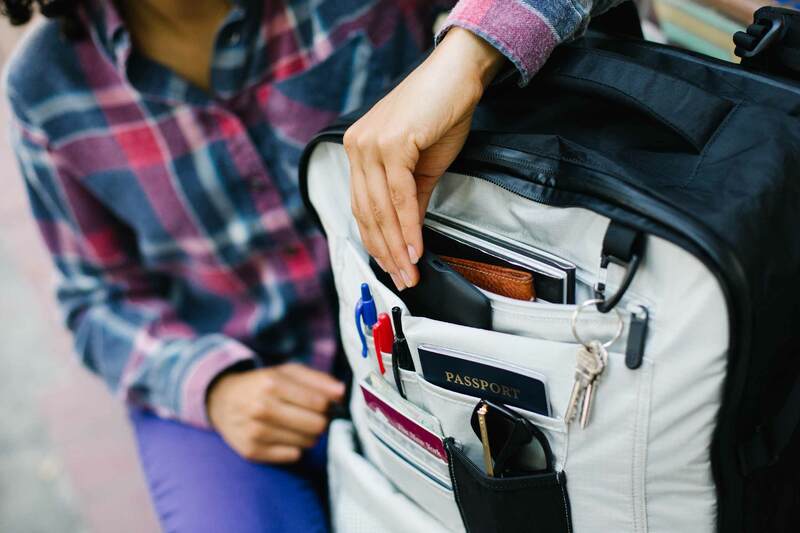 Your personal item can be a messenger bag, duffle bag, purse, or small daypack. Most airlines don’t publish specific size rules for personal items. Just make sure that you’re carrying it (no wheeled bags) and that it fits under the seat in front of you. Don’t carry an extra bag just because you can. Make sure that your personal item makes your trip easier. I prefer a daypack that can be packed into my carry on when not in use. 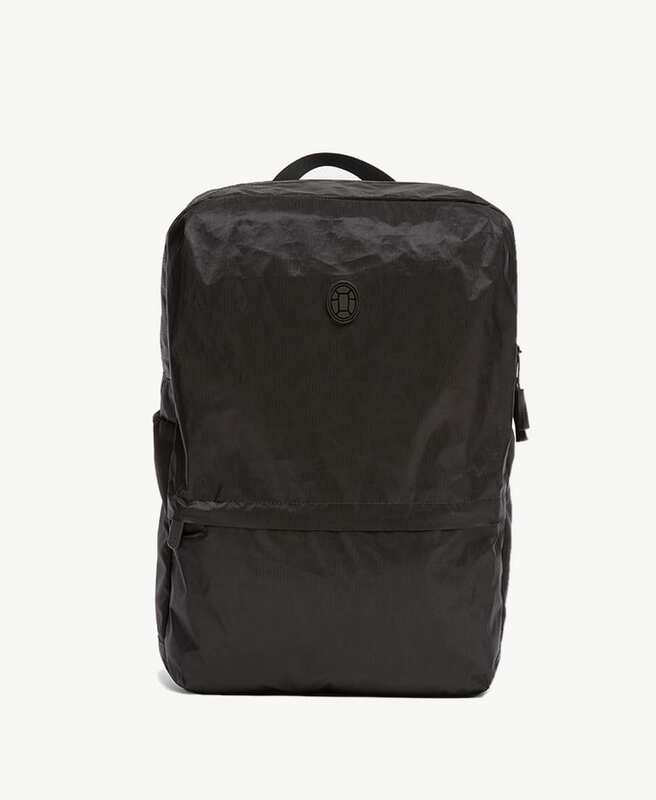 Pack the Outbreaker Daypack flat in your carry on for one bag travel. 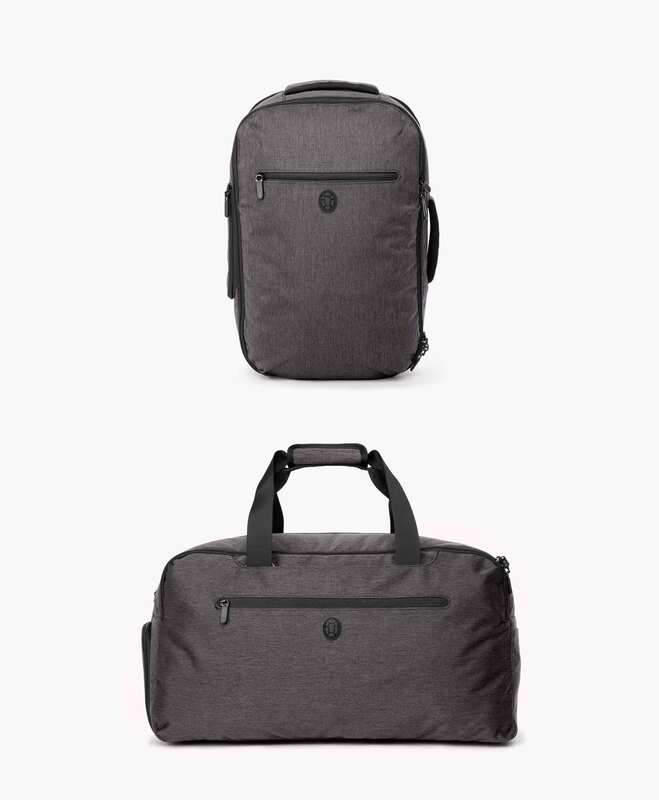 When you arrive at your destination, carry the daypack for any day of adventure: from sightseeing to working remotely from a cafe to exploring a new city on a drizzly day. No extra rain protection required. With the Setout Packable Daypack, you can carry everything you need for a day of sightseeing. The padded, mesh shoulder straps and back panel will breathe and feel comfortable, even on a hot day. 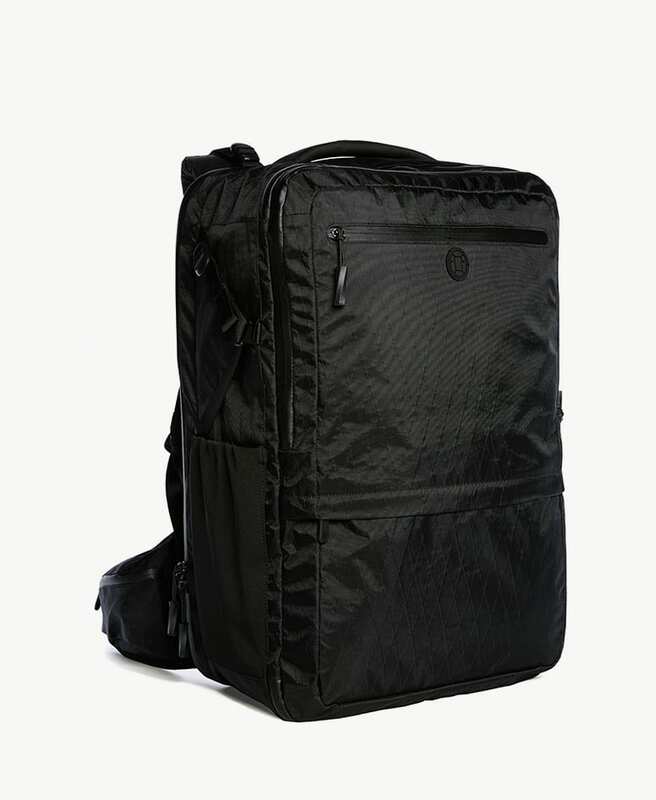 For one bag travel, it packs into its own front pocket and is easily stowable inside your carry on. Now that you’ve got everything organized to pack, how do you actually get it all in the bag? Should you roll clothes? Or fold them? The answer is… it depends. Believe it or not, there is a right way to pack, and learning to pack well will lower the stress level of your travels immensely. It’s the little things. Learn how to pack clothes to reduce wrinkles. And think through what goes in your carry on backpack or duffle and what goes in your personal item. There are tricks to packing suits and dress shirts too, which are worth learning for business travelers. Packing bras can be tricky. And shoes are always a challenge. Packing light is about more than just saving money. Packing light minimizes your physical and mental burden. Trade stuff for convenience, flexibility, and fun. Real travel is about your experiences, not your gear. Don’t worry about your gear. We spend inordinate amounts of time thinking about, discussing, and researching this stuff. We’ll do the heavy lifting for you. To simplify your future travels, bookmark this page then download the carry on packing list below. It’s a simple, printable distillation of this article that you can reference later. Once you get in some “reps” of traveling carry-on-only, you won’t need the list anymore. You’ll figure out what you really wear and use on the road. Your travel kit will become as effortless as your every day carry.